Cryotherapy is the use of extremely cold temperatures for medicinal purposes. It can be used for treatment or prevention of diseases and also as a way of pain management for sporting injuries. It can treat a variety of muscle and tissue pain or relieve sprains and swelling after soft tissue damage. In Europe, the demand for cryotherapy as a form of treatment has rapidly increased leading to the fast growth of development of cryo-saunas and cryo chambers. At Cryoaction, we offer a variety of cryotherapy chambers that can be hired by sporting teams and spas throughout Europe. 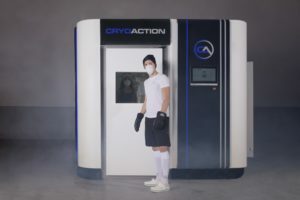 Owing to the increase in sporting activities across Europe, the demand for cryochambers is expected to increase by a significant 68 percent by 2026. Researches conducted reported that in 2016 alone, 200 cryochamber units were sold around Europe. By 2026 this number is expected to increase to around 336. The demand growth is also attributed to the aesthetic and dermatological benefits that beauty spas and doctors have reported for cryotherapy users. Poland leads Germany, England, France and the rest of the European countries in the percentage increase in demand for cryotherapy. Pain relief and muscle healing. One of the primary uses of cryotherapy is pain relief. It helps with the relief of joint and muscle pain and maintenance of related conditions like arthritis. This is similar to the application of ice-packs to sports-related injuries. To aid the process of weight loss. Sitting in the extremely cold conditions of a cryochamber will lead your body to increase its metabolism to keep up with the extreme cold conditions. Increase in body metabolism promotes the burning of fat and calories. A process that will eventually lead to weight loss. Prevention and treatment of health conditions. Cryotherapy is used strategically to reduce inflammation. Inflammation may occur superficially due to bodily injury during sporting or occupational activities. When it occurs internally, it may be due to infections or other grave reasons like cancer. Cryotherapy is used to reduced all kinds of inflammation. It may also be used to control the inflammations that could lead to dementia. Cryoaction offers a wide variety of cryotherapy chambers that can be used for beauty therapy purposes, medicinal purposes and by athletes that are involved in elite sports. They have a proven track record of providing quality services, and the testimonials from previous customers are already included on their website.